Hello PinkWhen readers! Justine from Cooking and Beer here. Happy March! I don’t know about you guys, but I’m totally ready for Spring. Don’t get me wrong. I enjoy a good snow day, but with just a couple of weeks left until the start of Spring, I’m craving some foods that celebrate the season! With Easter right around the corner, I’ve been dabbling in all foods that celebrate the holiday. 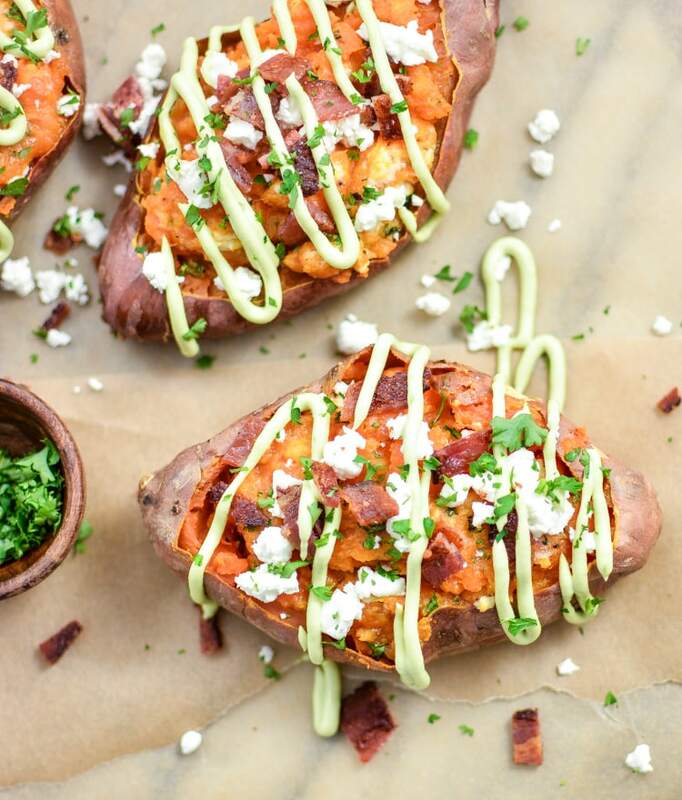 This recipe for brown butter twice baked sweet potatoes with goat’s cheese and avocado cream is just one of the many reasons to celebrate! 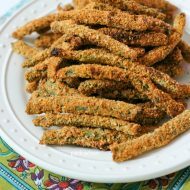 I’m always looking for fun new side dishes to incorporate with dinner. I don’t always go all out, but I always try to make them as interesting as possible. My better half and I eat a lot of potatoes, as he is definitely a meat and potatoes type of person. This is totally ok though. It makes putting fun spins on dinner all the more exciting! While most of these potato dishes consist of the plain russet or golden Yukon, I cook with red potatoes often, and sweet potatoes even more! Sweet potatoes are such a fun and healthy way to spice up a weeknight side dish. I will often bake them a day or two in advance, so that there is just a step or two left when dinner rolls around. I will eat them for breakfast, lunch or dinner if I have enough of them on hand! This recipe for brown butter twice baked sweet potatoes is super simple. Sweet potatoes are baked off in the oven until tender. Once they are tender and delicious-smelling, I release them from their cage and let them cool while I prepare the other components of the dish. To a bowl goes the flesh from the sweet potato, brown butter, goat’s cheese, parsley, bacon and a dash of salt and pepper. After the ingredients have been mashed to perfection, mound them back into the sweet potato skins. Bake them off once again, and that’s all there is to it! Sprinkle on any remaining bacon, parsley, and goat’s cheese. Then drizzle on the best part of the whole dish: the avocado cream. The avocado cream is just a simple combination of avocados, buttermilk and sour cream. It’s a great way to use up any avocados that are just on the verge of becoming overripe! Preheat your oven to 400 degrees F. Poke your sweet potatoes with a fork and place them directly on the rack of your oven. Place a piece of foil on the rack below to reduce mess. Bake the sweet potatoes for 45-50 minutes or until tender. Times may vary depending on how hot your oven gets. Remove the potatoes from the oven and let stand at room temperature until they are cool enough to handle, about 20-30 minutes. Leave the oven on. While your potatoes are cooling, melt the butter over medium heat. Continue to cook the butter, stirring frequently, until brown bits begin to form on the bottom of the pan, about 5-6 minutes. Pay close attention as the butter can quickly go from brown to burnt in a matter of seconds. Once you see the brown bits forming and a nutty aroma fills the air, pull the butter from the heat immediately. Set aside. Cut the tops off of the sweet potatoes, lengthwise. Scoop the sweet potato flesh into a medium bowl, leaving the skins in tact. To the bowl, add the brown butter, 2 tablespoons of the fresh parsley, 3/4 of the chopped bacon, and 4 ounces of the goat’s cheese. Sprinkle with salt and black pepper to taste and mash the ingredients together until combined. Scoop the filling back into the sweet potatoes. Place the potatoes on a baking sheet that has been lined with foil or parchment paper. Place them back in the oven to bake for 25 minutes. While your potatoes are baking for a second time, prepare your avocado cream. In the bowl of your food processor or blender, combine the avocados, sour cream and buttermilk. Add a dash of salt and pepper and pulse until completely smooth and creamy. Once your potatoes have baked, remove from oven. Sprinkle on the remaining parsley, bacon and goat’s cheese. Drizzle with avocado cream and serve immediately. I hope you enjoy this recipe for brown butter twice baked sweet potatoes! Have a happy Thursday everyone, and I’ll see you next month! Oh my heavens, these potatoes look spectacular. I just adore Justine’s recipes! I know! I am ready to pack her up and move her to Louisiana and make her my neighbor. She’s a BEAST in the kitchen and her photography is hands down AMAZING. Love her! These are amazing! The photos are almost cruel they are so delicious looking! I had pinned, stumbled and tweeted before I was halfway through the post. 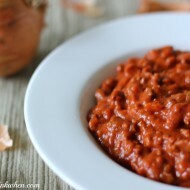 I love that you used sweet potatoes for this both for flavor but adding some more nutrients to the recipe. This my be my perfect potato! 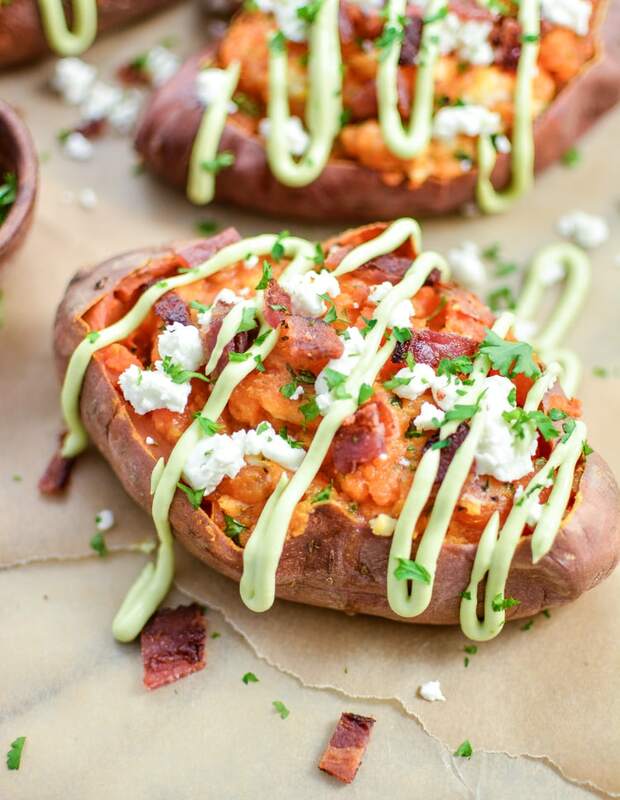 I love everything about this…sweet potatoes, brown butter, bacon, goat cheese, avocado cream! Making these VERY soon! Love Justine’s recipes and these potatoes look awesome!!! Stop it. These are fantastic! If I had avocados, I’d make them for dinner tonight! 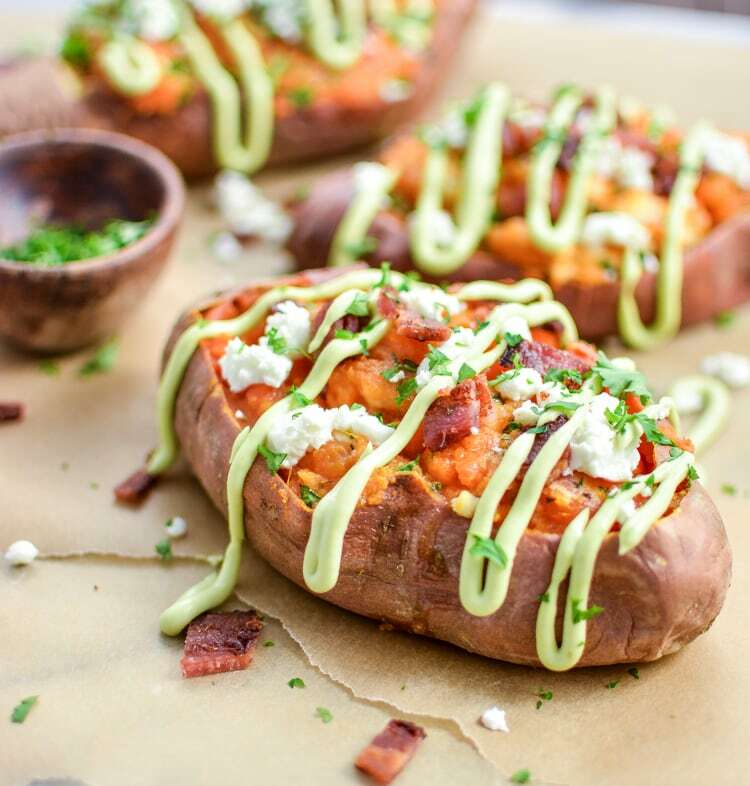 As if I needed another reason to love sweet potatoes…these twice baked ones are seriously calling my name. And your photos are totally amazing! My heart skipped a beat! I need to bake more sweet potatoes. This recipe is perfection! Found your post on Kathy’s link up. I’ve been on a such a baked potato kick lately, I had to click over. These look delicious, and I’ll definitely try soon! This is such an amazing recipe and my stomach is totally growling for it even though it’s midnight and I probably won’t eat until tomorrow. 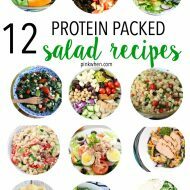 I love twice baked potatoes in general, but these are full of nutritious goodies! Thanks for linking up to Wonderful Wed. blog hop. I love sweet potatoes. I am going to have to try them. I have never had anything like this. This caught my eye on Two Cup Tuesdays, and it’s so gorgeous! I love how colorful this dish is and the avocado cream looks so delicious. Thanks for sharing! These sweet potatoes look amazing! I am featuring you this week, at Simple Supper Tuesday. We hope you can join us again, starting Monday night at 8pm, EST. This looks so yummy! I love sweet potatoes and that avocado cream, wow!